We’ve had a ton of people ask us why we sold our brand new, 37 foot 5th wheel and bought a 1972 Airstream that needed a complete overhaul. I mean, if selling your house and almost everything you own to travel around the country in 300 square feet with your family of 6 isn’t crazy enough how about buying an even smaller 44 year old Airstream that needs a complete renovation and crashing at your wife’s parents until it’s done? In case you hadn’t noticed, we embrace the crazy. There is a method to the madness, though. After living on the road for a year and a half, we had a much clearer vision of how we wanted our daily lives to look. A vision that was pretty different from when we started this adventure. We realized pretty quickly that most private RV parks are crowded, filled with full-time residents and outrageously priced. Paying $50/night was defeating the purpose of not having a mortgage. And everything was so cramped that it felt like we were in a subdivision anyway. Memberships like Thousand Trails save you money, but don’t help much if you hate the parks. We also realized that we loved State and National parks. Natural settings, (usually) plenty of breathing room - and there were always amazing hikes or adventures nearby. Most were much more reasonable price-wise ($15-30/night), but often lacked a sewer hookup or water at your site. Oh, and our 37 foot 5th wheel plus long bed dually meant we often couldn’t fit in spots. But probably the biggest revelation was when we took the rig out “boondocking.” That’s really just a weird way of saying you camped without sewer, water or electric hookups - and often didn’t pay anything to stay there because it’s just open land. We weren’t even properly setup to camp off the grid, but we loved it. There was something about the magnificent views, quiet solitude and crazy unpredictability of it that called to us. Finally, we were just getting too comfortable. The 5th wheel was literally like a house. We were finding ourselves staying inside far too often instead of going out exploring. In our own rooms instead of being together. It was time to challenge ourselves again. So, those were the big ideas that led us to the big change. But big ideas aren’t much without details. 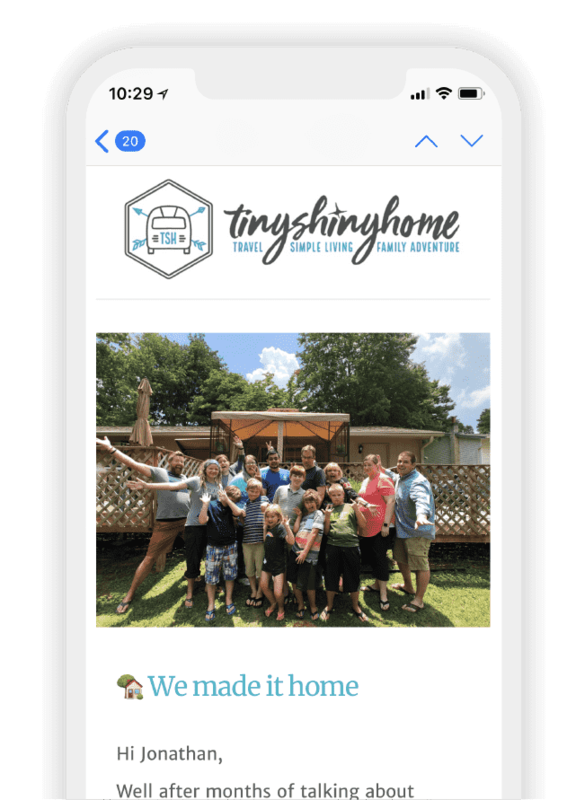 Below I’ll dig into each specific thing we had to change for this to work - and how we settled on a vintage Airstream for our full-time, off the grid travels. Our 5th wheel had 4 slide-outs that made for a huge living space, but were also a bit of a pain when we had to move. Staying at a state park with no sewer hookups and need to dump your tanks? Time to rearrange everything inside so you can pull you slides back in, hook up and take it to the dump station. A large portable gray tank helped - but then we had to find a place to store it when traveling. Our previous RV didn’t come with mini awnings over the slides so I had to climb up on the roof and sweep them off every single time we pulled them in. Also, because the hitch plate was in the middle of our truck bed, hooking up and getting all our stuff positioned properly was like putting a puzzle together. Maybe we just had too much stuff, I don’t know. It was a whole thing every time we moved. Either way, we wanted to simplify the whole setup/tear-down process. Moving to something like an Airstream meant no slide outs so our stuff shouldn’t have to move around drastically when it’s time to pack up. Also, because it hitches up at the bumper, our truck bed (now with a rolling, lockable cover) can be used for more permanent storage that doesn’t need to be emptied and repacked every time we move. Sweet! If you’ve followed us for any length of time, you know that we’ve had several repairs done to the 5th wheel. Which is weird, because it was new when we bought it. Turns out the RV industry has pretty lousy standards. Not only that, but the shops that service them are overbooked and don’t know what they’re doing. I can’t tell you how many times we scheduled a repair, went through the major hassle of finding a place to stay for the night only to find out the next day that half of the parts either weren’t there or the wrong ones had been sent. It was becoming clear that we needed to own the repair side of this adventure, but when you have no idea how the thing was put together (and no prior handyman experience) you just end up at the mercy of unqualified RV service shops. This is one of the main reasons we opted to go with a full renovation project rather than a “90% finished” Airstream. With Ashley’s dad’s help we are going to learn exactly how everything is put together in this rig. And we’ll know how to fix it ourselves if something breaks. Between our long bed pickup and the 37’ 5th wheel, we were over 55’ long! Squeezing into state park sites and maneuvering tight turns was all kinds of stress inducing. Shoot, even making a left turn with two lanes was tricky. Initially we really wanted to get a 27’ Airstream, but after looking at a couple they felt too short for a family of 6. Plus the older Airstreams seemed to be 25’ or 31’ - not much in between. Around 1995 they moved to an 8 1/2 foot body instead of an 8 foot body. So it made more sense to go 31’ since we were losing width all the way down. Even though our new truck has a regular sized truck bed (6.75), we don’t save that much length going down the road because it’s a bumper pull. But having a rig closer to 30 feet opens up a lot more options and spots than we had before. Low overpasses. (Don't worry, that's not us in that picture!) Those two words strike fear into the heart of anyone traveling with a 5th wheel or Class A motorhome. Ours clocked in at 12.5 feet tall - and believe it or not there are plenty of bridges and overpasses that are not tall enough for your rig! Travel days included us pouring over different iPhone apps to make sure we weren’t going to run into a height issue when moving from place to place. I still remember driving on a Parkway in upstate New York. Ashley was asleep and I got to the first bridge that had a big 12’ 7” sign on it. I scrambled trying to pull up the app that shows us low clearance only to see at least 6 more bridges coming up, each getting lower and lower. I pulled off on the side of the road and a state trooper immediately pulled up to tell us we had to keep moving. Which didn’t make a lot of sense. Either I stay here for a minute and figure this out or I rip the top off my RV and I block the road for the next couple of hours. Thankfully we made it through the next bridge (barely) and got off on an exit to go around the rest of them. All that to say - we became exhausted with worrying about tearing the top off our home. Even though we’re lifting our Airstream and adding larger tires, we should still be closer to 10 feet or less when it’s all said and done. And since the Airstream is a bumper pull, we can move our bikes from the roof to the bed and save height there, too. That means fewer overpasses and low hanging trees to worry about. Sweet! Our previous RV was over 10,000 lbs empty! By the time we loaded it up with stuff, put ourselves in the truck and got on the scales we were pushing 22,000 lbs total. That’s a lot of weight going down the road. It’s a lot of weight to try to stop quickly. We felt it on long inclines and downhills. And it made us nervous. Also, there was that time when we tried to boondock and got stuck in the mud. We were way too heavy. The lack 4 wheel drive didn’t help either - we remedied that with the new truck, though! Weight was a major factor when we started talking about boondocking more. We couldn’t even pull up in a grassy field without making huge indentions in the ground. How would we go anywhere fun with this beast? The Airstream by comparison weighs a scant 5,000 lbs empty. Or it did, at least. We’re not sure exactly how it’ll shake out since we’re basically re-doing everything inside (and lots outside) - but it will definitely be way less than the 14,000 lbs our 5th wheel weighed when full. Losing weight feels good! Ashley read my first draft of this post and nicely said, "break it up into two parts - it's way too long." And she was right. It turned into a small novel. 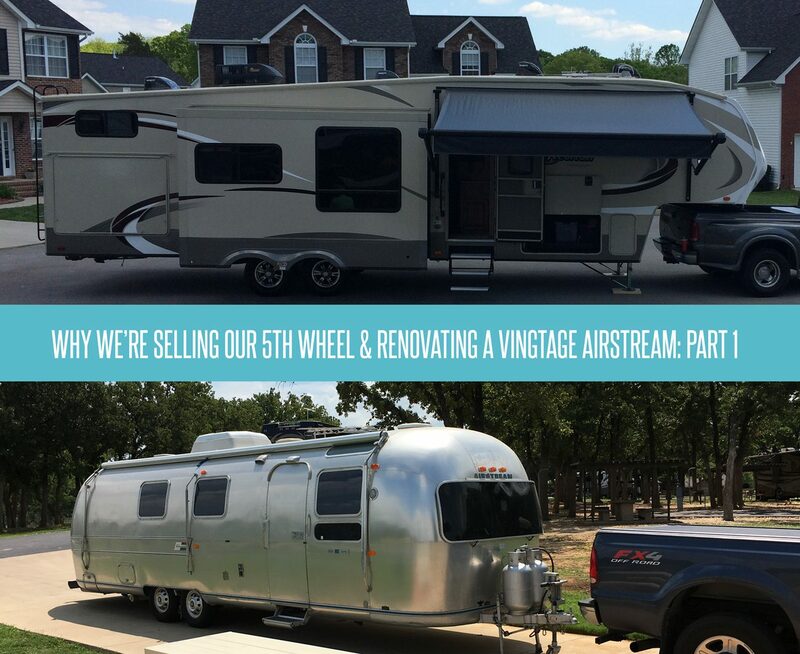 The good news is the rest is written so you shouldn't have to wait too long to find out the other reasons we sold the 5th wheel and bought an Airstream. But for now, I'm sure you have questions. Feel free to fire away in the comments! Edit: Part 2 is right here!